Going whole head bleached something that i've been wanting to do since forever especially when i've always dreamed of having platinum ash blonde hair like my favorite character from Game of Thrones Daenerys Targaryen. Yea, i know she wears a wig, in reality Emilia Clarke is a borne brunette. Still that ain't gonna stop me from going from bleaching my whole head lol, honestly one of my biggest fears are my hair might just start falling off due to scalp sensitivity towards the harsh chemicals used in bleaching processes. I've read cases of people losing alot of hair, it becomes extra brittle to the point it's better to just shave'em off already. Sounds scary? Having past experiences as a hair model, i know very well that once you have a funky haircut or colour, it's better to wear make up everyday to suit your new hairstyle. Especially those who goe for lighter colours need to wear make up or else they will look like corpses on a bad hair day lol. Your face will look super pale and shrunken it, it basically just needs colour. When i had the opportunity to get my hair done in Daisuke Salon De Coiffure, if you have not heard of them it is actually owned by a veteran Japanese hairstylist named Daisuke-san who has been residing in Malaysia for quite a long time and now he has a kawaii wife name Ai & 3 furkids- Megu, Sakura & Tong Tong (can die from their fluffy adorable personality). As you all know how Japanese people pride themselves with their passion & work for hair, basically specializing in it. So aren't you grateful now that we have access to one in PJ, yet affordably priced with GOOD RESULTS. I actually spent some time trying to figure which colour i should sport next since i've been quite toned down since december last year. Always going for the "safe" and boring colours. Trust me, i was so fickle that i couldn't decide lol even Amanda (my colourist) would love to strangle me since i think i almost drove her up the wall with my fickleness XD Lost count of how many times i changed colours, from purple, blue to blonde and i forgot what else. When Amanda suggested for me to go go blonde (as in bleached whole head first, colours can decide later) since it's something i've never done before, so heck why not right? That's when the journey of going blonde begun. And did i regret any bit of this decision, i can proudly assure you no. Life is too short to cry over wrong hair colours lol, when young just experiment because when you are much older you won't have much freedom to go wild with your hair anymore. 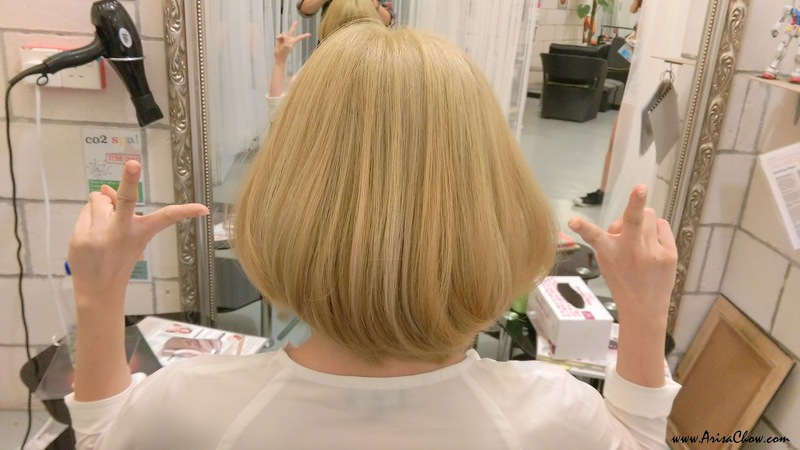 I did voice out my concerns about brittle hair, scalp and all to Amanda and Daisuke-san, but all was rest assured when they told me that they will be using a new product (from Canada) that allows a person's hair to withstand multiple bleaching in a day without degrading the hair quality. All hairstylist i've known who have experiences bleaching hair would normally advice us to take a few days break before proceeding with the 3rd-4th bleaching process because our hair can't handle too much harsh chemicals in one day. It is possible to bleach you hair 4-5 times a day but without proper hair protection and treatment your hair would easily show the symptoms i've listed above. That's when i was introduced to bondplex! It's apparently highly used among international celebrities as we know they frequently change their haircolours and mostly it only takes them one day to achieve light colours. Super fast. How is that all possible without damaging one's hair? -Obviously Bondplex. Still healthy looking after 3 strong bleaching sessions. The usual scalp burning sensation, but for hair colours i will bear all the pain lol. Pain defers from people to people, mine is generally more pain as i don't have much tolerance towards pain. Feels like a general ant biting all over your scalp lol. What makes this product so special that even celebrity hairstylists trust them? It's because Bondplex is formulated with Anti Breakage System (A.B.S) which builds a bond (protective layer) for your hair before the start of any treatment. This allows our hair to maintain suppleness and strength to give our hair a longer lasting shine. It's usually mixed in with other chemicals such as hairdye or bleach and not considered as an additional hair treatment. You can use bondplex in colouring treatments, ultra lift hair colours, Keratin straighteners and perms just to name a few. It is also highly recommended for frequent hair dyers or dry damaged hair from previous bleaching treatments. What we once deem as hopeless to save (dry hair) is no longer impossible with Bondplex. 2nd level of bleaching i had gudetama colour ed hair lol this whole process can be tiring for both parties and requires you to be there the whole day. If you are feeling peckish while being immobilized from ongoing hair treatments, Daisuke Salon id open to food catering services from nearby restaurants around the block . So all you have to do is wait for the food to be served to you while you just chill. Never knew what this bottle of this treatment was capable of till i experienced it for myself. My roots were considered virgin hair as it's been a few month since i did anything to my hair in fear of damaging it even further so bleaching that part would usually need extra effort compared to the ends of my hair which has been already bleached mildly previously. Needing extra effort means EXTRA BLEACHING which made me kinda nervous but lo with bondplex the whole bleaching process went smoothly! 3 times in a row and my hair is extra smooth and it actually made my current ash blonde dye look extra obvious. Going blonde has never been so fast and easy! Thank you so much for the kind compliments everyone, really..credits should all go to Daisuke salon for the amazing hair work. If any of you plans to YOLO like me to bleach whole head and want to get it done within a day, i would highly recommend coming here as Bondplex is Daisuke Salon's specialty product. You won't find this elsewhere, trust me! I seriously love my hair so much, that i selfie alot till i swore あなた rolled his eyes haha! But need to rajin to wake up earlier to style it (using heated straightener or blow dry) if not my hair won't look so fabulous like in photos. When i was in Japan even their own people there couldn't tell i was a foreigner, always got mistaken as a local lol. 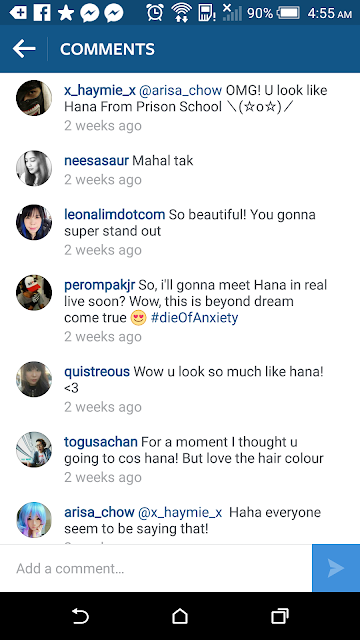 I somehow truly believe i was born into the wrong country lol, even when my hair was black back in Malaysia i often get asked whether i am a Japanese or Korean -_- makes me wonder which part of me actually screams those two lel. Just quote my blog (www.arisachow.com)/ show this post or name (Arisa Chow) to get 20% off your bill. For first timers only. I think the hair colour suits you, a stark contrast from other colours on you! nice hair color. wish to visit , but im also off on monday. haha seriously bo? Not really, had to wear extra fair foundation shade than my usual :P you also super fair what! Confirm you can pull it off geh! look like Korean girl. cute and the colour suit you as you have fair skin. i love your new look! seriously you look hotter la babe! Okay you hair us so stunning now Macam rambut orang puteh dah !!!!! Do you find hard to take care yourr current hair? And I think it suits you well! Wow... You had a great hair. I love the colour of your hair very much. That's not a colour that Chinese can carry so well. You took wonderful, though. Blondes have more fun, right! Your new hair style is nice and suits you! Look like a Japanese lady now. Love your hair.... you really fit in being Japanese now..... kawaiiii........ gosh......... I am envious.....!!!!!! Looks so cool dear, nice colour and match you so much. That's awesome. You are looking gorgeous. 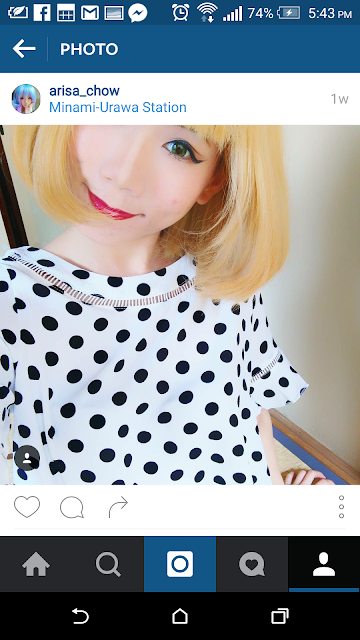 love your blonde hair Arisa : ) It matches with your fair skin tone : ) Pretty! really nice your hair. next colour is pink like Ai's hahah. you really look Jap la dear. OMG! I love your hair color! Suits you well. So lucky! I wanna do it again too but ah maintenance is difficult. You definitely look good in blond. It matches your complexion and features so well! I think it's super awesome that you persists even after the pain. That's dedication right there.